You might think your neighbour is an irrational and silly woman. However, while the above example is an extreme one, the reality is all of us hold beliefs that can feel true, but which may not be true at all. We all have hunches: some of our hunches are right, but others are wrong. In cognitive-behavioural therapy (CBT), people are encouraged to view their thoughts, beliefs and hunches as hypotheses to be tested. With the aforementioned example of the tiger, for example, the neighbour would be asked to consider the evidence for and against their beliefs. Now, she may well admit there is little if any evidence to support her fearful and superstitious beliefs. Nevertheless, there may still be a head-heart divide. Intellectually, she might know her beliefs are false, but the fears may still feel real. The key to bridging this head-heart divide is behavioural change – that means abandoning safety behaviours (in this case, the sprinkling of the salt) so that catastrophic predictions can be disconfirmed. 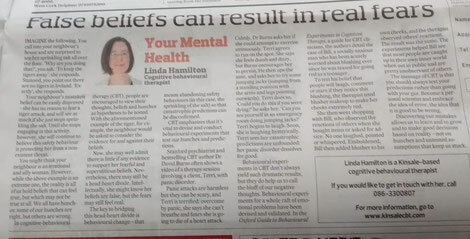 CBT emphasises that it’s vital to devise and conduct behavioural experiments that test our hunches and predictions. Stanford psychiatrist and bestselling CBT author Dr David Burns often shows a video of a therapy session involving a client, Terri, with panic disorder. Panic attacks are harmless but they can be scary, and Terri is terrified: overcome by panic, she says she can’t breathe and fears she is going to die of a heart attack. Calmly, Dr Burns asks her if she could attempt to exercise strenuously. Terri agrees to run on the spot. She says she feels dumb and dizzy, but Burns encourages her to persist. He then ups the ante, and asks her to try some jumping jacks (jumping from a standing position with the arms and legs pointing outwards). Terri does so. “Could you do this if you were dying?" he asks her. "Can you see yourself in an emergency room doing jumping jacks?" Terri begins to laugh. Soon, she is laughing hysterically. Terri sees her catastrophic predictions are unfounded: her panic disorder dissolves for good. Behavioural experiments in CBT don’t always yield such dramatic results, but they do help us to call the bluff of our negative thoughts. Behavioural experiments for a whole raft of emotional problems have been devised and validated. In the Oxford Guide to Behavioural Experiments in Cognitive Therapy, a guide for CBT clinicians, the authors detail the case of Bill, a socially anxious man who has been acutely worried about blushing ever since he was teased for going red as a teenager. To test his belief that people will laugh, comment or stare if they notice this blushing, the therapist used blusher makeup to make her cheeks extremely red. She then went shopping with Bill, who observed the reactions of others when she bought items or asked for advice. No one laughed, pointed or whispered. Emboldened, Bill then added blusher to his own cheeks, and the therapist observed others’ reactions. The result was the same. The experiments helped Bill see that most people are caught up in their own inner world when out in public and are pretty unobservant of others. The message of CBT is that you should always test your predictions rather than going with your gut. Become a personal scientist and embrace the idea of error, the idea that it is good to be wrong. Discovering our mistakes allows us to learn and to grow and to make good decisions based on reality – not on hunches and untested assumptions that keep us stuck.